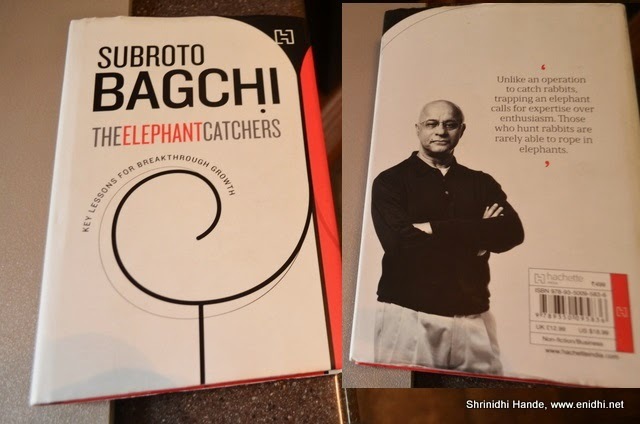 The elephant catchers is Mindtree co-founder Subrato Bagchi’s second book and focuses on challenges faced in growing a start up to next level. It contains several practical experiences and tips, mostly coming from Subrato’s Mindtree experience. In this short review, I am making an attempt to provide key essence/message from this book. Book opens with the fact that Siddaganga mutt in Tumkur operates several education institutions with thousands of students, without any help of mega softwares or hundreds of management experts. Swamiji has no elaborate plan or articulated strategy to run everything. Swamiji is not daunted by the idea of scale.With sheer simplicity and commitment, things fall into place. The second chapter talks about strategy and states that most of the corporate strategy meets are often useless. It cites example of New York city, where in order to reduce rate of murder, Mayor asked cops to go hard on petty criminals. Tough seemed irrelevant, it helped reduce murders because petty criminals were the source of most of the disputes and quarrels that ended in murder. It seems Marriot lets its customers directly walk into their rooms, before completing the check-in formalities. This is because through stress analysis they find that customers are max stressed after they reach the hotel at the end of a long flight etc. Holding them back for another 5-10 mins for check in formalities was not a good idea- it can be done an hour or so later after the guest relaxes a bit. The elephant catchers: The main topic of the book: it elaborates two approaches of hunting- rabit hunting- where small groups enter forest, one group makes loud sound that drives animals out of their habitats and move towards the other group ready to hunt with arrows or traps and end of the day they manage to catch a few rabbits and other small animals. Not a big catch, but this is enough to feed the villagers for sometime. Rabit hunters are available aplenty, won’t cost much and almost always manage to catch some animals. On the other hand there are elephant catchers- they are expensive, plan months to study elephant herd movement patterns, dig large kheddas to trap them in right position and work to drive the herd towards these kheddas, hoping that one elephant falls down. It is a big catch, if they can manage. But success is not guaranteed. Most of the time, team may return empty handed and might have to work for months before a success. Subrato says that small/mid size companies need elephant catchers to grow to next level. These are the people who can bag multi million dollar deals, but often come at a price and huge expense account. Companies sometimes bleed money for large time, hoping for that one big deal, which is never guaranteed. He says some salemen could be grizzly bear looking for migrating salmon (Lazy animals that stay with their mouth open all day and hope at some point of time their pray would position itself in its mouth and all this lazy animal needs to do is close the mouth at the right moment. It mentions about the importance of having an able body of board of directors. Cites Satyam scandal and also gives practical tips while hiring consultants. Bagchi relates leading the company as that of gardening- saplings need to be cared for long term before they can give results, different plants have different watering, nutritional needs and one should eliminate weeds and pests. He also cautions about distractions one might get in their work. Subrato mentions some bold moves he and his team made, to get a foothold into deals that traditionally went to Accenture and IBMs of the world. Finally he explains the need for quitting when the time is right. Overall it is a good book to read for aspiring leaders. Awesome review on the book. Will surely buy and read it. Thank You for the detailed review on the book.